Just 20 minutes of daily reading or hearing books read aloud makes young brains grow strong and ready to read. You can help even the youngest of children get ready to read with songs, poems, rhymes, stories and books. Research shows that all children benefit from the daily practice of reading and hearing books read aloud. Kids who are reading improve their skills by practicing every day. Twenty minutes of reading every day helps kids of all ages build good habits and big vocabularies. Reading together builds strong families, too, so everyone benefits from reading books aloud. 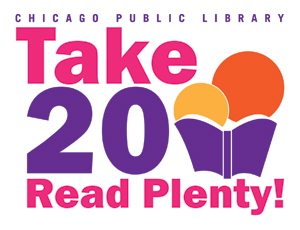 Mayor Rahm Emanuel, First Lady Amy Rule and Chicago Public Library encourage you to Take 20, Read Plenty! Join us by pledging to take 20 minutes every day to read with a child. It’s the most important 20 minutes of the day. Not sure where to start? Try these recommended readalouds (also in Spanish) with a child in your life. Kids: Read with a Child Today, Take the Pledge! Let us know you’re making the commitment to read with a child for 20 minutes every day.